Are you in the mood for superheroic characters fighting scores of scary 3D creatures amid exploding landmarks while computer-rendered populations are crushed beneath tossed cars and collapsing buildings? Then check out The Avengers. Or Pacific Rim. Or just about anything directed by Michael Bay or Roland Emmerich. 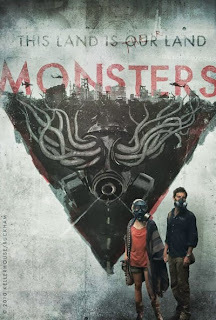 But if you need a break from cliche scares and lookalike blockbusters and prefer more character-driven sci-fi--with relatable human beings who aren't wielding weapons or one-liners--then Monsters, an impressive micro-budget alien invasion flick from 2010, should hit your sweet spot. It certainly hit mine. 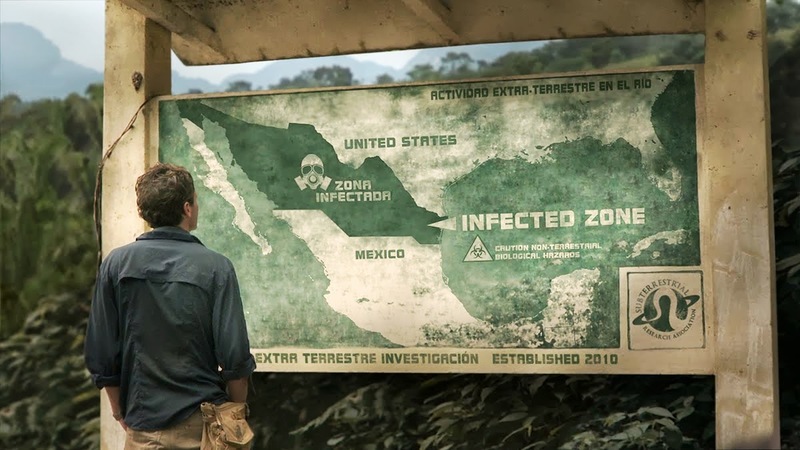 Set six years after an extraterrestrial species has populated a swath of northern Mexico now walled off from the United States, Monsters utilizes a War of the Worlds-like premise to concentrate on the human toll of an alien occupation--an occupation fought with increasing (and unscrupulous) force by a desperate U.S. military. And yet the focus isn't on the military, or even the United States, but on the growing relationship between an American photojournalist (Scoot McNairy) and his boss's daughter (Whitney Able) as they try to make their way safely through the "infected" zone and back home. That makes Monsters as much indie road movie and relationship drama as sci-fi pic, a neat sleight of hand that should cater to genre geeks and film snobs alike. This may not be obvious from the opening scene--shot with a jittery amateur camera as a military rescue party is attacked by one of the enormous tentacled creatures. A nod to previous first-person horror fare like Blair Witch Project and Cloverfield, the scene simultaneously establishes the larger stakes while sneakily planting seeds for future revelation. 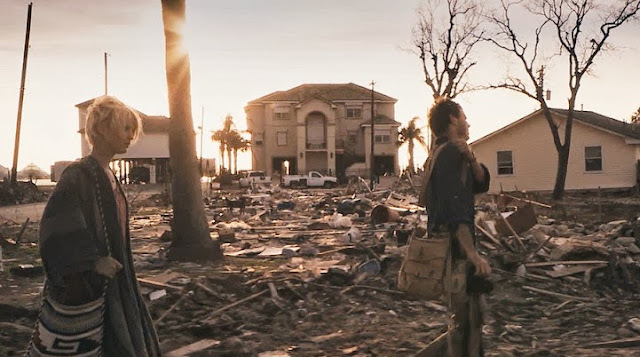 Comparisons might also be made to District 9 (which came out after Monsters finished production), but as with Cloverfield, that highly accomplished film ultimately resorted to a more traditional approach--and had a budget vastly larger than the $100,000 or so used by first-time writer/director Gareth Edwards. Functioning as his own cameraman and effects designer, Edwards set out to make "the world's most realistic monster movie." To achieve that he used guerilla-style tactics, transporting his lead actors and a crew of four(!) to Texas and Latin America, where they shot improvised dialogue in found locations. Along the way they recruited extras and a supporting cast, convincing local bystanders, shopkeepers, and even soldiers to participate--achieving impressive results. Of course the key to fully selling such an approach is in the details, and Edwards makes the most of his off-the-shelf visual effects and production design to create entirely convincing post-war settings. There's incredible verisimilitude in each scene, from the naturalistic performances to the spot-on wartime signage, occupation maps, and TV news stories. (A passing pickup truck hauling a wrecked plane's engine is a nice touch.) There seems to have been no shortage of found wreckage for the crew to stage scenes in, lending enough production value to make the film's budget look like millions instead of thousands. As with Jaws, which famously had to shoot around its barely functioning fake shark, budget limitations served an advantage here, forcing the director to keep his eerily luminescent (and well-realized) creatures mostly off-screen for much of the running time. Instead their menace is conveyed through sound and implication, as well as on the faces of the fear-wracked humans. It makes for a quietly gripping atmosphere, one that builds as we're given each new glimpse of these mysterious invaders. Also playing to the film's strengths is the relative obscurity of leads McNairy and Able, whose lack of movie-star baggage and past associations lets us perceive them as people, not heroes, making their characters both more relatable and less easily pigeonholed. Their low-key performances--and dialogue I never suspected was improvised--remain engaging throughout, the chemistry between them growing slowly and naturally as the danger around them ebbs and flows. The fact that he chose not to be involved with a Monsters sequel, which its producer promises will provide "the excitement, thrills and set pieces of a genre film," bodes well. But there's still that Godzilla in the room. Let's hope its summer-tentpole-sized budget won't blind Edwards to the rewards possible in stories founded on character, not spectacle. Although even if Godzilla does end up another bloated Hollywood mess, we can at least enjoy the understated pleasures of Monsters. Such cinematic creatures are rare, and will always be welcomed with open arms. You are right one the money with this one. I love when someone who has budget restraints is still able to come up with a movie which trumps the hollywood blockbuster by being true to the art of character driven film making.